Nonni’s Foods’ unprecedented success with its newest better-for-you brand led the leading biscotti baker to introduce Mango Coconut THINaddictives to shelves. The wholesome, guilt-free treat that shoppers love is now available at select grocers nationwide. 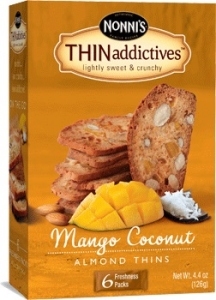 Mango Coconut THINaddictives were developed to meet the growing demand for tropical fruit flavors. According to the National Mango Board, mango consumption has increased by 53 percent since 2005. Similarly, coconut has quickly become a mainstream flavor due to its healthy attributes, receiving national recognition and attention from nutritional experts. The tropical fruit combination baked into each almond thin creates a fruitful escape shoppers crave. The superior combination of quality care and premium ingredients makes THINaddictives a snack consumers can feel good about. For more information and a store locator, visit THINaddictives at www.nonnis.com or at facebook.com/THINaddictives.